science — bringing relief to thousands of people every year. Its regenerative process heals damage from neurodegeneration through a minimally invasive procedure, which in addition to being relatively pain-free compared to surgeries has nearly none of the side-effects of commercial drugs. However, many Indians are still unaware of its advantages due to a lack of reliable information sources. To bridge this knowledge gap, Plexus has decided to educate people through both online and offline channels — gaining us the trust of thousands from all over the world. Keeping with our efforts to educate more people about the potential of stem cells, Plexus went live on March 15, 2018 on our Facebook page. During the webinar, titled #AskDrNaeem, Dr Sadiq answered queries on stem cell therapy and its benefits from almost 16,000 viewers across the globe! As April is Autism Awareness Month, we bring you some questions on Autism that the viewers asked and the answers by Dr Na’eem Sadiq. Is stem cell therapy safe for Autistic children? Stem cell therapy is perfectly safe for patients suffering from all kinds of disorders. In fact, to ensure zero risk of infections, allergies, or hypersensitivity, Plexus uses autologous stem cells that are extracted from the patient’s own body as opposed to allogeneic stem cells, which are taken from donors. Typically, stem cell therapy for Autism works best on young children. However, even in the case of older children, it has shown results in alleviating symptoms such as speech impairment, hesitation to interact socially, and repetitive behavior. We are particularly proud of a child who came to our center with these and other signs of Autism and post therapy has found a spot in a regular school. Is stem cell therapy recommended for all age groups? 9-month-old baby (suffering from preventricular dystrophy) to a 96-year-old man (a patient of multiple strokes, Parkinson’s disease, and Dementia). As we have seen a speedy recovery in younger patients who have undergone therapy, we recommend an earlier diagnosis. But on the whole, we believe it’s never too late to consider stem cell therapy as a treatment option for chronic diseases. Stem cell therapy is an incredibly versatile treatment option that can be applied across a spectrum of disorders — from developmental to neurodegenerative. This, combined with its safe and pain-free technique, is the reason stem cell therapy is becoming a sought-after treatment option around the world. 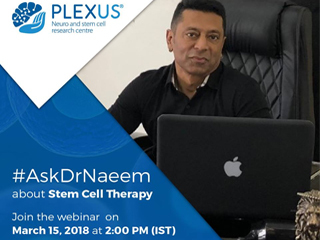 But in the age of information overload, it is important to have your basics about stem cell therapy in place — a goal Plexus can help you achieve through #AskDrNaeem. Follow our Facebook page to learn about how stem cell therapy can transform your life in our next session.